Owning a dog while living in a city can present you with a variety of challenges and leash reactivity is one of the toughest! If your dog has started to bark and lunge at triggers on daily walks, then this article is for you. Even loud noises and scents can be triggers! Since living in a city means you’re highly likely to come across several of these triggers as soon as you step outside, this behavior—commonly known as leash reactivity—can make going on a walk with your dog feel more like navigating your way through a war zone! So what is happening when your dog behaves like this? The answer to this question is complex, so first let’s examine your dog’s physiological response itself and how that relates to natural canine drives and a state of energy known as arousal. PREY DRIVE represents a dog's natural desire to chase and capture prey. PACK DRIVE is a dog’s natural desire to be part of a group and is connected to social interactions like greeting, playing and mating behaviors. DEFENSE DRIVE is governed by the instincts for survival and self-preservation and relates to your dog’s guarding instincts. It consists of both fight and flight behaviors. Defense drive is more complex than prey and pack drive, because the same stimulus that can make a dog aggressive (fight), can also elicit avoidance (flight) behaviors. Arousal is a state of energy in which a dog is excited and on high alert. It is caused by a series of hormonal reactions that take place in a dog’s body that ready them to spring into action. Arousal states can be triggered via sight, sound, smell, and engagement, so your dog's senses are a key component of what prompts your dog’s biological drives to kick in. Depending on the situation, arousal can be a good thing or a not-so-good thing. For instance, raising your dog’s arousal level by playing a game of tug helps stimulate drive and focus during training; however, if your dog gets too aroused, their body becomes flooded with more energy than it can process, and they may start to air snap, nip, or run around out of control, unable to respond to any of your requests. This over-arousal can happen when a dog feels frustrated, stressed, or over-stimulated and—when you add restraint into the equation—can trigger an activation of their primal survival instincts. Much like a cornered dog that bites as a defense mechanism, if a dog on a leash feels thwarted (prevent from doing something), trapped (forced to endure something unwanted) or on the defense (desiring to ward off or compete with an approaching trigger), the resulting frustration can cause them to get over-aroused to the point of triggering a fight or flight response. The subsequent adrenaline surge, caused by a release of epinephrine hormone into the bloodstream, is what spurs your dog into action and causes them to bark and lunge so wildly at the end of the leash. Triggers, therefore, stimulate one of your dog’s drive modes. 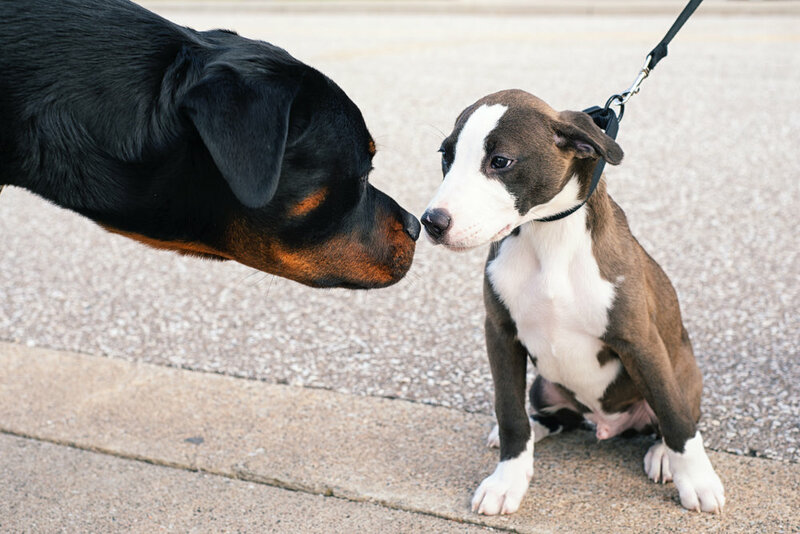 However, since a leashed dog can’t respond to a trigger in the way that their impulses dictate, the natural desire to chase, socialize, avoid contact, size up the other dog, or go on the defense--all of which are dependent on your dog's temperament and inherited mix of drives--can quickly turn into regular bouts of stress or frustration that lead to over-arousal. Many dog parents, unaware of what is causing the behavior, unknowingly foster its growth by placing their dog in situations that prompt the unwanted response. And similar to a battery that never stops charging, leash reactivity can quickly escalate into regular meltdowns because a dog is rarely able to burn off the excess energy created by all of the over-arousal. This is why it can quickly become the norm on daily walks, almost as if overnight. If your dog is showing signs of leash reactivity, it's a good idea to get in touch with a qualified positive dog trainer that has solid experience working with the behavior. It's best to avoid trainers that use aversive methods such as training with prong or e-collars, as this will only make the behavior worse.